i hate ipl….because it wastes my time. Hi Hitesh, Thanks for reading and expressing your views. Hi Bhavneet, Thanks for the feedback. Appreciate !!! Hi Prakash, thanks for your comments. It may well happen even in 2014 ! Very interesting post, interesting to hear the views on the IPL in India. Hi, Thanks for visiting my post and for your feedback ! Thank u for your feedback ! Hi nice blog Anand, very entertaining read indeed. Thanks for reading & leaving your feedback ! Karnataka assembly elections are scheduled for the first week of May. IPL or not! Many thanks for your comment on my blog – I enjoyed reading yours as well!! I am the editor of a new online cricket magazine called http://www.thecricketmagazine.com. Having read this piece I would love to feature some more of your cricket writing on the site. The website is still under construction but you can see the style that we are trying to achieve – have a look and let me know your thoughts. Hi Alex, Thanks for stopping by and leaving your feedback. I will take a look at your magazine and leave my feedback soon. Thanks for the link. Thanks for the feedback. Yes very true ! Hi Rishabh, Thanks for checking my blog and for your feedback ! Well written…this my first time watching IPL…and I am loving it. I am a super proud fan of RCB and RR…Keep up the good work !!! Hey, Thanks a ton for your comments ! Interesting view of the IPL within Infia. Hi, Thank you for your feedback. Appreciate. I discovered your “April and the IPL Typhoid & found the post awesome ! Thanks for stopping by and your feedback. Haha. I liked it! 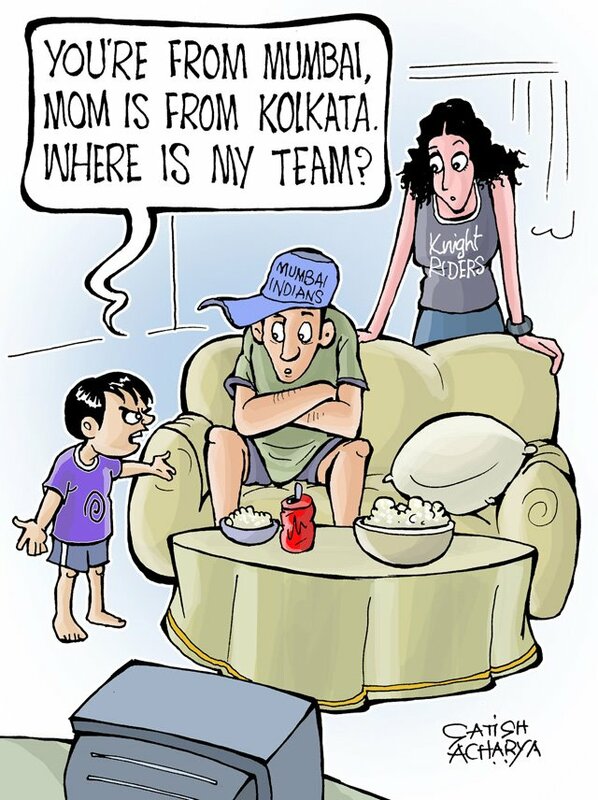 All the women watch IPL at home, including me. Fortunately, there are no remote wars here. I liked how you caught the essence of IPL in one post! Sachi, Thank you for your feedback !! Nice view and thoughts about IPL! Thanks for stopping by and for the feedback ! nice write up mate! I like the summary. Thank you for reading the post and for the comments ! Nicely written. We are a cricket crazy nation. A very interesting post, summing up all aspects of the IPL. Being an Indian based in England, it is particularly interesting for me to see what the opinion of the IPL is back in India. Hello, Thanks for stopping by and for your feedback. Appreciate. @anandkumar a good article ,highlights the benefits ,drawback faced by all in the business department . Hi Thanks for the read and for the feedback !!! Thank you Rohit for reading and leaving your feedback. The typhoid continued for a while. Now mostly over. Thanks for the words.